S ee m in great co nd it io n no i ss ue s se en. 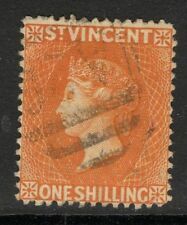 ST. VINCENT SG24, 1s vermilion, USED. Cat £85. PART OF A GROUP OF ST VINCENT. 对于中国请注意，我非常建议注册的邮件（有条件的运输选项）作为最常见的邮件发送正常邮件失去. ДЛЯ РОССИИ ПОЖАЛУЙСТА, ОБРАЩАЙТЕСЬ, Я ВЫСОКО РЕКОМЕНДУЕТ ЗАРЕГИСТРИРОВАННУЮ ПОЧТУ (ЭКСПЕДИРОВАННЫЙ ВАРИАНТ ПЕРЕВОЗКЫ ГРУЗА) КАК САМЫЕ ИЗДЕЛИЯ ОТПРАВЛЯТЬ РЕГУЛЯРНЫЙ ПОЧТОВЫЙ ПОЛУЧЕНИЕ ПОЛУЧИТЬ ПОТЕРЮ. 1891 1/- Red-Orange. ST VINCENT. UK RECORDED (UPTO £100 TOTAL) £2.00. UK ORDINARY (UPTO £40 TOTAL) £1.00. Mint & Used St Vincent 1955-1966. 62 Stamps. 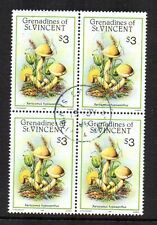 St Vincent 1955-1966 Mint & Used Lot. 1955 Mostly MNH With A Few VLMM. 1955 Used 1 x 2c, 1 x 3c, 1 x 4c. 1966 Mint 1 x 1c, 1 x 4c, 1 x 20c & 1 x 40c. 1964 Mint 1 x 1c. 1965 Mint 1 x 1c. 1965 Mint 1 x 4c & 1 x 48c. 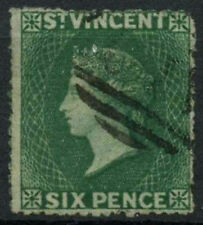 Mint & Used St Vincent 1891-1911. 20 Stamps. St Vincent 1861-1911 Mint & Used Lot. 1882-1883 Mint 1 x 1d. 1885-1893 Mint 2 x 1/2d. 1893-1894 Mint Overprint. 1899 Mint 1 x 1/2d & 1 x 1d. 1902 Mint 1 x 1/2d & 1 x 1d. 1861 Used 1 x 6d 15.1/2 Rough Perf. 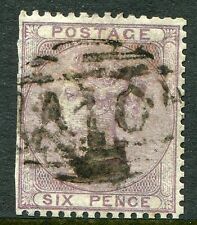 SG 72 St Vincent 1897 5d dull mauve & black. Very fine used. 1869 QVI 4d no wmk., perf 11-12.5, SG 12 used, couple of rough perfs, etc. Year of issue: 1872. Grade: Fine. Condition: Used. Newly Listed/New Arrivals. Commonwealth & Empire. Collections & Mixtures. Era: Queen Victoria (1837-1901). Fine used. This will only change when heavier or odd sized lots are bought or when, in. All lots are sold as described. 1881 4d Bright Blue. ST VINCENT. UK ORDINARY (UPTO £40 TOTAL) £1.00. AVERAGE USED. UK RECORDED (UPTO £100 TOTAL) £2.00.